The primary goal of CLOUD is to understand the influence of galactic cosmic rays (GCRs) on aerosols and clouds, and their implications for climate. 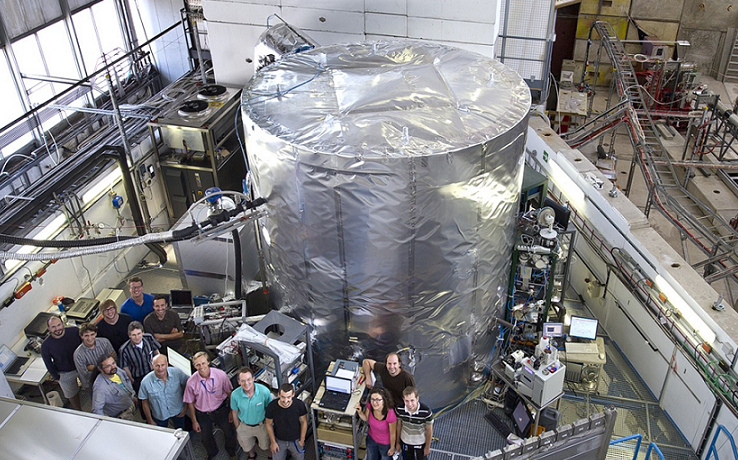 "Global atmospheric particle formation from CERN CLOUD measurements", http://science.sciencemag.org/content/early/2016/10/26/science.aaf2649"
At the heart of the experiment is a stainless steel chamber of volume 26m3. This is surrounded by state of the art instrumentation measuring the gases and particles inside. The chamber is filled with synthetic air made from liquid nitrogen and liquid oxygen. Small quantities of other gases such as sulphur dioxide or organic compounds are added, and aerosol particles are formed and characterised. Experiments often focus on measuring the rate of formation of aerosol particles with different mixtures of gases in the chamber, and investigating the effect of ionisation on this formation rate. The ionisation produced by cosmic rays can be enhanced with a high energy particle beam from the CERN Proton Synchrotron, or removed with a strong electric field. In addition, if the humidity inside the chamber is close to 100%, cooling achieved by fast adiabatic expansion can be used to make clouds in the chamber. At warm temperatures, this allows chemical processes inside cloud droplets to be studied and, at lower temperatures, experiments on ice microphysics are carried out.